It’s said you can tell when spaghetti is cooked by throwing it at the ceiling. If it sticks, it’s done. And you can tell when a sound engineer’s brain is cooked by the way he or she slings the spaghetti of electrical cables, inevitable in live performance and studio session, desultorily about when he or she is just about done in. With traditional bands, guitarists have it easy. Radio transmitters carry audio to pedalboards and FX racks, keeping cables neat. Sound engineers, meanwhile, have electrical spaghetti to contend with in order to deliver power, audio and digital data. You’d think synth players would be laughing up their sleeves, what with electronic keyboards and computers requiring little electrical looming. But then they boot Propellerhead’s Reason. On the face of it, Reason looks slicky rack-mounty, but a dab of the computer’s Tab key swings the thing around and induces cold sweat. There, at the rack’s rear, are sockets galore gagging to be stuffed with virtual spaghetti, bringing echoes of brain-boiling modular synth configuration confusion. While Propellerhead Software’s modular design of Reason makes for great flexibility, in that you can wang together insanely left-field configs, it’s easy to become entangled in a crazy cat’s-cradle of virtual patch cables, which is why it’s a blessing to have obsessives like Nucleus Soundlabs’ head honcho Jeremy Janzen and his team more than keen to get busy with the complicated stuff, as evidenced by the launch of Filter Research 2. Nucleus produces quite a range of techie products, going a bundle on ReFill bundles for Reason and resources for such soft synths as Native Instruments' Massive, Lennar Digital's Sylenth, select Rob Papen products, Spectrasonics' Stylus RMX and even the venerable Steinberg Xphraze. But Mr Janzen just can’t keep his hands off Reason. Among numerous commercial ReFill collections, all of which are underpinned by considerations of uniqueness, full control mapping and supplemented with (praise be!) 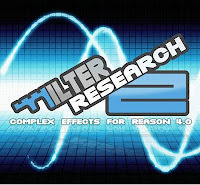 extensive documentation, we’ve the new Filter Research 2. The first Filter Research offering, with its 192 Combinator concoctions, all but 10 of which are devised from scratch, has been on sale at $34/£21.69 for some time now and is billed as a collection of effects devices for Reason 4. FR2 follows similar lines - it’s not a bunch of instruments, but scratch-built Combinator-based effects at which to bung your Reason instrument sounds. Click on the image above for an overview, then hit your browser’s Back button to return to MuzoBlog’s salient summaries. Filter Research 2 - Video Documentation Demo from Jeremy Janzen on Vimeo. Interesting, no? Now then, with you being a musician, more interested in making a racket than rigging the devices that produce said racket, Filter Research 2 provides a valuable, time-saving resource. You pay yer dollars, download the ReFill, pore for a time over the supplied documentation and tutorials, then decide ‘stuff it. Let’s just load something and piss about with the knobs’. All remarkably easy, all usefully automatable and the Filter Research-rendered sonics wobbling your monitors’ drivers could well entice you traverse entirely new directions when running up a timbre, sequence or track from scratch. You will, of course, need a recent version of Reason (Combinator is not supported by Reason 3 or prior), but while Nucleus’ promo material bangs on about Reason 4, early adopters of Reason 5 need fear not - FR2 loads up just fine in Props’ latest baby (I know - I tested it) and, by way of demonstration, here’s a pic, at left, of the back of the Reason 5 rack showing how mad the patch cable array can become. I've minimized the many, many Thor modules for reasons of space, but it's clear that we've an awful lot of cables a-lurk at rear and, while colour coded, it's still a feat of concentration to remember what is plugged into what. A cable out of place could render a combi quite useless, although it can at times give rise to happy accidents (something of a 'glass half full' view). 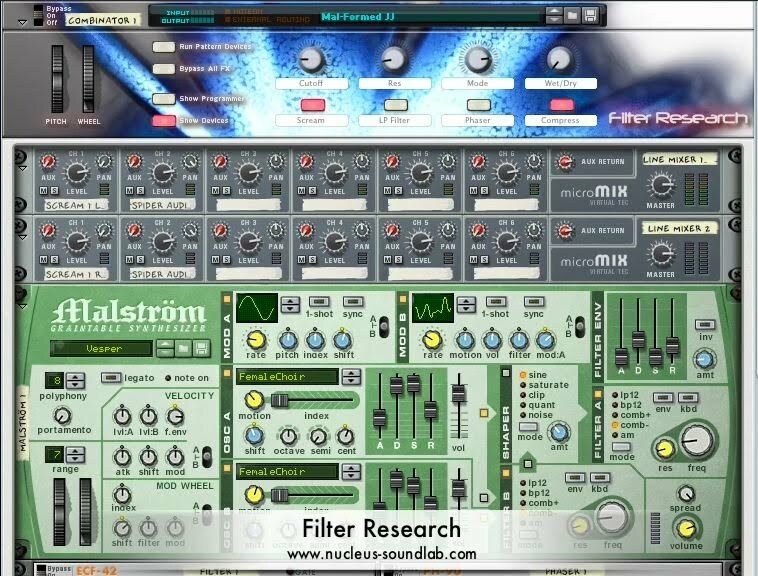 Filter Research 2 - Key Split FX Documentation from Jeremy Janzen on Vimeo. Not bad, eh? If your urge to explore further cannot be tempered, and you’ve Reason 4 or 5 for Windows or OS X, then get yourself a downloadable demo containing 25 full patches, plus documentation, and dive in. DIY Reason riggers may pass Filter Research 2 by, preferring instead to devise their own devisalments, although they should bear in mind that FR’s Combis are customisable and variants can be saved out, so it’s fair grist to the modification mill. Those less inclined to attack the back of the Reason rack, but who desire something a little more deranged for their divertimenti, are in for many a jolly. At a mere £37.60 in proper money, you’ve Combis that stack up nicely against the sounds output by dedicated plug-in instruments and hardware synthesizers and which spread smoothly across a wealth of genres. 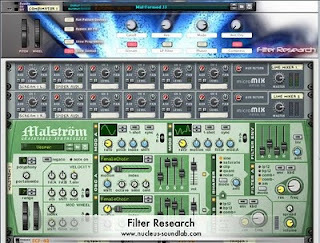 Filter Research 2 is so new, it hasn’t made Propellerheads’ Prop Shop as yet, so those so tempted should head for Nucleus Soundlab’s PayPal-driven shopping cart to buy and download the 340MB package of ReFill, PDF documentation and five mighty MOV tutorials for the Epic Combis. By their own admission, Jeremy and the team set the bar high when it comes to sound design. In the case of Filter Research 2, there appears to be plenty of daylight betwixt bar and buttocks. FR2 is no Fosbury flop, it’s a genre-straddle-jump encouraging adventurous leaps of musical imagination. Now excuse me while my metaphors slam, all gangling and inelegant, into the crash-mat.